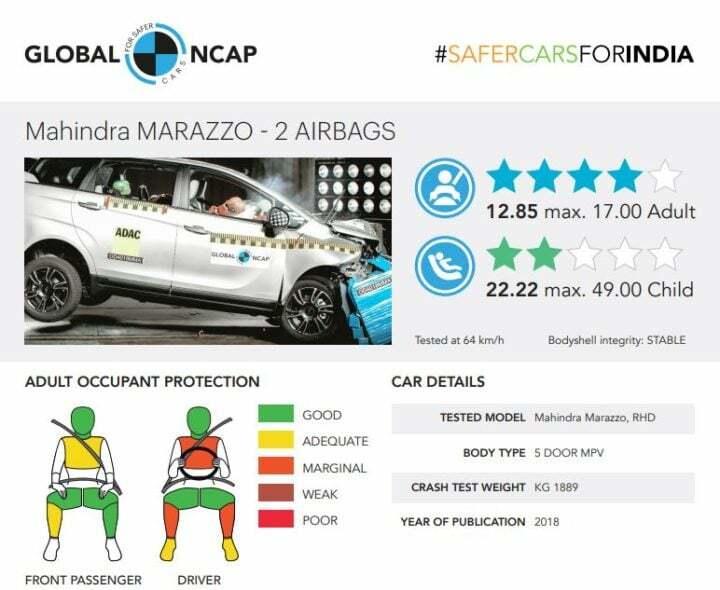 Mahindra Marazzo scores 4 Stars in Global NCAP safety tests! 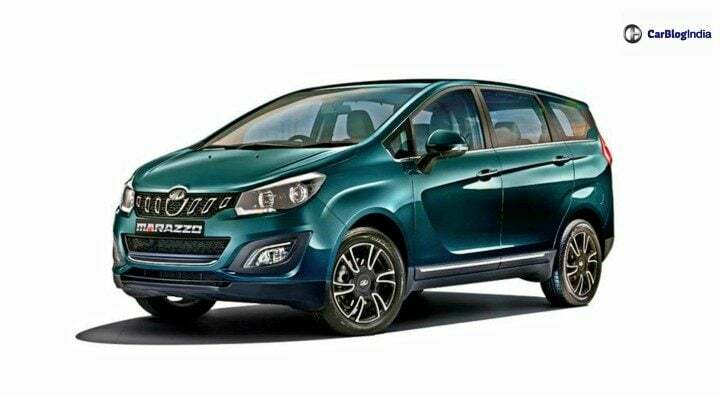 In a recently conducted crash test by the independent body Global NCAP, the made in India Mahindra Marazzo MPV has scored an impressive 4-star safety rating. The recently launched 7-seater MPV from Mahindra scored a 4-star rating in adult occupant protection. Meanwhile, it scored 2-stars with child occupant protection at the rear. The Mahindra Marazzo comes with dual airbags as standard right from the base variant onwards. In addition to this, other standard safety equipment includes an Anti-lock braking system, Electronic brakeforce distribution and ISOFIX child seat anchorage points. The Marazzo is an all-new product from the stable of Mahindra. It has been developed by Mahindra’s teams in India and at its North American technology centre. Not only this, but the exterior styling of this MPV has been done with inputs from the famous Italian design house Pininfarina. In a separate test, Global NCAP also performed a crash test on the sub-compact SUV Tata Nexon. In this test, the Nexon scored an impressive and an India first, five-star safety rating for the adult occupant. 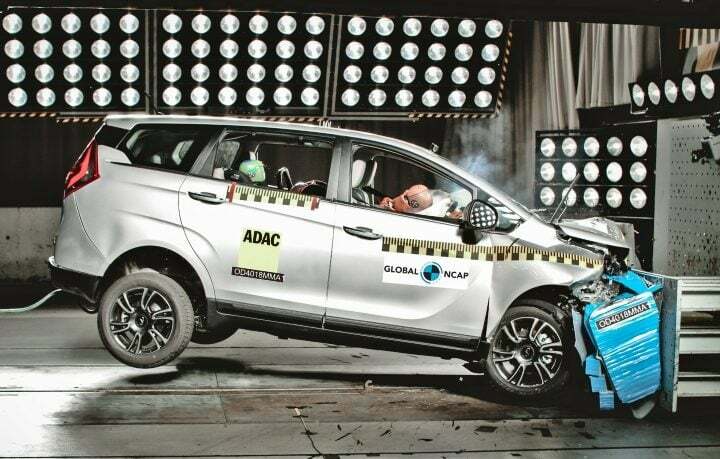 Coming back to the Mahindra Marazzo, the Global NCAP report stated that the protection offered to the driver and passenger’s head and neck was good. However, the driver’s chest only managed to show marginal protection while the same for the passenger was adequate. The protection offered to the knees of both the driver as well as the passenger was good. The important thing to note here is that the body shell of the Mahindra Marazzo was declared as stable in this crash test. In fact, it is capable of sustaining further loading. Moving on to the protection for child occupant, the child seat for the 3-year-old was installed forward facing with ISOFIX and top tether and was not able to prevent excessive forward movement during the impact leaving the head vulnerable while fair protection was offered to the chest. The 18-month-old CRS (child restraint system) was installed with ISOFIX and leg support rearward facing and it showed good protection for head and chest. The Mahindra Marazzo currently retails in India in-between the price tag of INR 9.99 lakh to INR 13.90 lakh (ex-showroom). It comes only with a 1.5-litre, 4-cylinder diesel engine and a standard with a 6-speed manual gearbox.